Fashion is the vehicle through which a particular beauty ideal travels from the towering skyscrapers housing the offices of the industry’s most influential glossies to our mass consciousness. Across the pages of fashion magazines lay perfectly symmetrical faces with flawless, porcelain skin, and long and lean statuesque models of near perfection. It’s odd then to find amid these same pages the antithesis of the beauty ideal promoted by the industry machine. 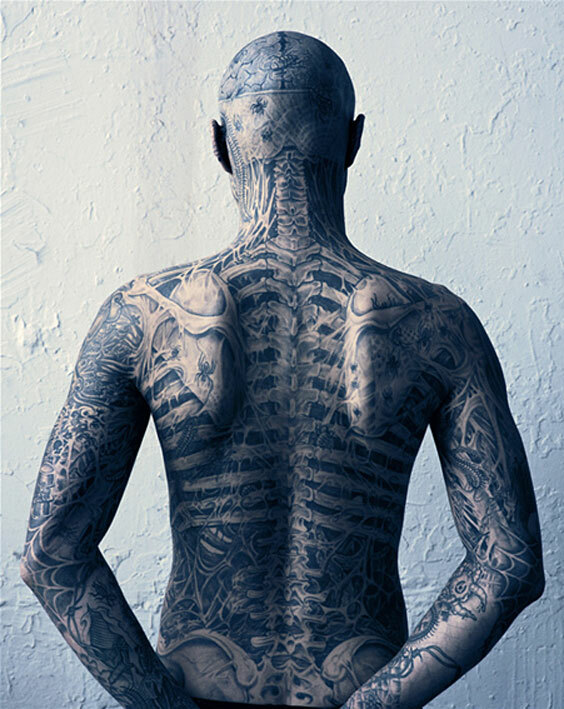 A young man inked from the waist up to resemble what was originally known as a snake-deity from West Africa and Haiti, but redefined through popular culture as a soulless corpse brought back to life, 25 year-old model and circus performer Rick Genest is as close as you will ever get to a real-life zombie, with a life-size skeleton tattooed across his angular frame, and dark, filled-in circles drawn around his eyes mimicking a skeleton’s hollow gaze. His skin isn’t flawless, but rather marred by dark, sinuous lines on his scalp, which suggests an exposed brain. Fine strokes around, and on the lips, form a skeleton’s toothy smile, while the rest of his upper body—the canvas on which the framework of bones, cartilage, and rigid tissue, which make up a skeleton, is drawn—with all the creepy crawlers, spider webs, and other iconic sinister markings of the living dead, snaking through the drawn carcass. Genest’s skeleton is an exact and precise replica, the work of a fastidious tattoo artist, I’m sure. 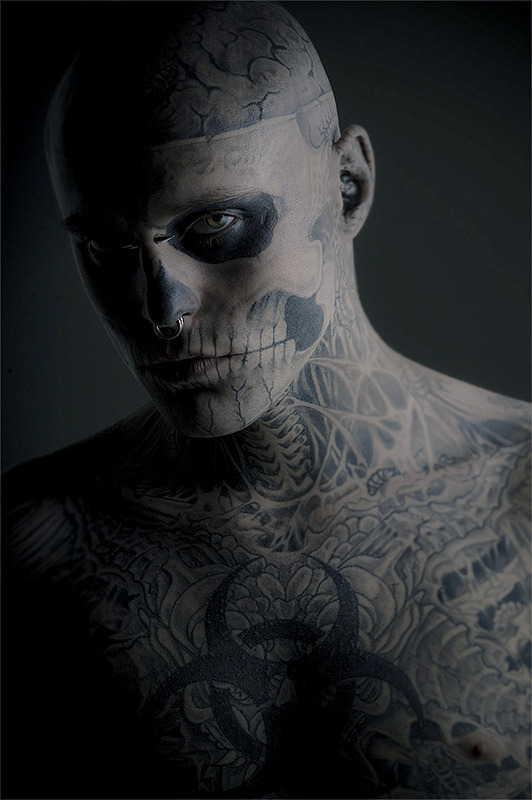 Zombie Boy, or Rico the Zombie as Genest’s also known as, is perhaps the epitome of antifashion, with a freakish appearance best fit for a circus act. Yet, he now populates catwalks and the pages of fashion magazines as the new face of French fashion house Mugler’s first menswear collection under new creative director Nicola Formichetti, which Genest is rumoured to have inspired. 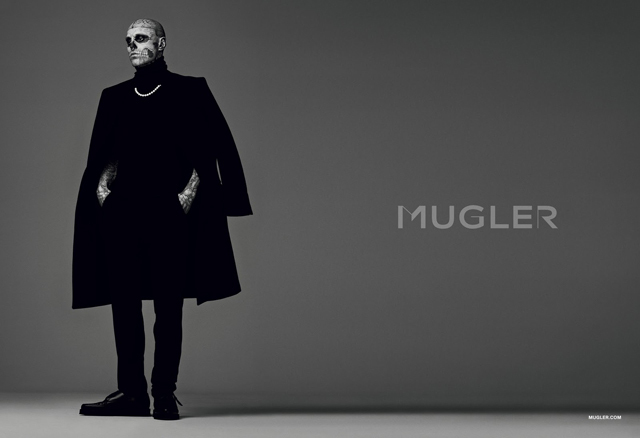 Most recently, Genest appeared in a fashion spread styled by Formichetti for the sixth volume of Vogue Hommes Japan. 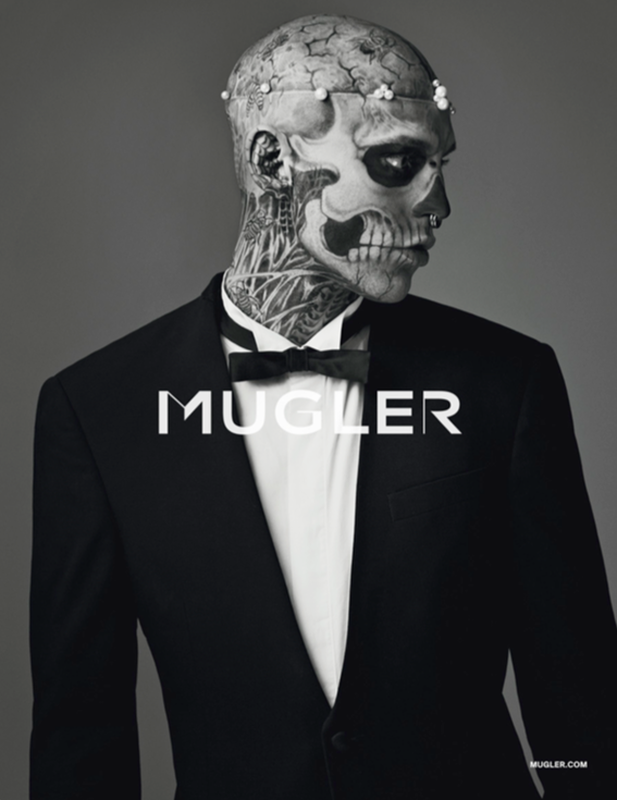 Is Zombie Boy an unlikely muse, a temporary fixture in a world that celebrates a very rigid beauty ideal, or is this the start of a revolution? A revolution? Probably not. A temporary fixture in a world with a clearly defined and established ideal? More likely. An unlikely muse? Not at all. Genest’s look is not one he’s adopted out of contempt for fashion or in direct opposition to its rigid ideal of beauty, but as one will surmise from his discussions on the matter, as a personal aesthetic choice. But like most things or persons that consciously or unwittingly oppose societal norms or socially acceptable ways, he symbolizes rebellion against what is deemed acceptable outward appearance. And fashion, as elitist, impenetrable, and conventional a world as it may be, takes to antifashion for inspiration. Baggy jeans, the Goth look, and “proletarianized jeans” have all been swept up and made socially acceptable by mainstream fashion. By appropriating antifashions, fashion places its stamp of approval on them and deems them fashionable. This, sociologist Fred Davis argues, is a mutually beneficial relationship, whereby fashion serves to democratize antifashions while antifashions breathe new life into fashion at usually critical times when it is in need of novelty. I am a huge fan of tattoos, but how Genest has taken it from body adornment to the body as a complete work of art, is something completely different. Such an amazing transformation. I couldn’t agree more. If he weren’t made of flesh and blood, I’d hang him up on my wall 😉 Thankfully, photographs do capture the work of art that is Genest quite beautifully.